The weekend I made these it was for a housewarming party, and I made them along with a few other desserts. Now I love to cook, y'all know that. But baking isn't really my favorite these days... Being on my feet in a hot kitchen with the oven on for hours only adds up to a backache, swollen feet and a very grumpy pregnant Momma in my house. But I was determined to get these done, even though it did take a couple tries... Oh these brownies hated me!! The first batch flopped, and I mean FLOPPED! They were crusty and sunken and not what I would want to serve at a party (though they tasted fine, and are sitting in my freezer while I figure out what to do with them... thinking Brownie Trifle!) So I made them again, same recipe, but different less humid day. And they were perfect! Still not sure what caused the first batch to fail, but the second batch was the perfect little mini muffin, that was moist and fluffy just how I wanted them to be! And they were a hit at the party too, not to mention passed the inspection of my picky 3 year old! Overall these are actually quite easy, and perfect for any party! In the bowl of your mixer whisk together the flour, sugar, baking powder, baking soda, salt and cocoa. Add in the shortening, 1/2 cup water and vanilla and beat on medium until combined, scraping down the sides at least once. Then add the other 1/2 cup of water and eggs and beat 2 more minutes, until fully combined. Then fold in the chocolate chips. Preheat the oven to 350F degrees, and spray a mini muffin pan with non stick spray (I used Baker's Joy with the flour in it). Using a 1 Tablespoon scoop, scoop batter into each well. Bake for 12-15 minutes or until springs back when touched. Let them cool in the pan for a couple minutes before serving. These can be made the day before and kept in an airtight container for up to 3 days. These really were quite simple, and such a crowd pleaser. The kids loved them, and so did the adults! I'd give them a 4.5 star rating! 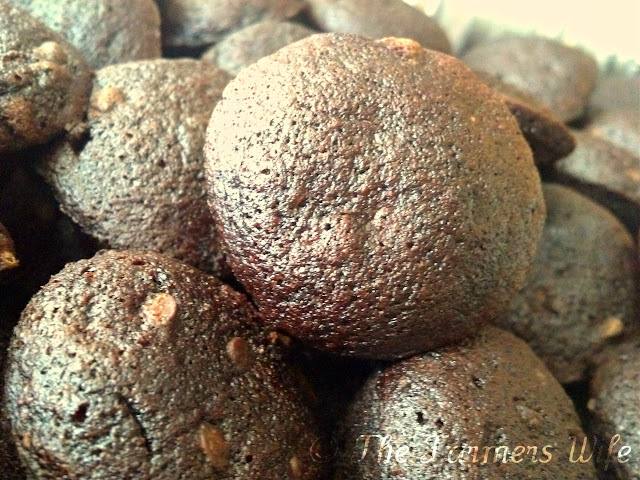 Brownie Bites are so irresistable aren't they! A great use for a mini-muffin pan! They look delicious..great for quick snack!